It’s never been easier to take control of your steam shower experience! The Mr. 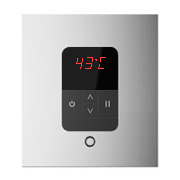 Steam iTempo control family features a digital display, with adjustable temperature settings. 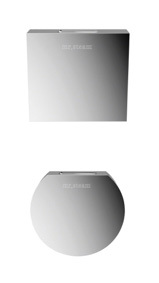 Your choice of Square or Round fascia with matching Aroma Steam Head to suit your tap ware and shower head design. Manufactured in solid brass with an elegant polished chrome finish as standard. Programmable temperature in C or F.
Typically installed within the steam shower. Option temperature probe required when controller fitted outside of the steam shower. Comes in seven designer finishes: Indent and available upon request. Pairs with Mr. Steam eSeries generators as well as the wireless iGenie® control and HomeWizard®. iTempo steam heads complement a variety of décor choices and remain “cool-to-the-touch” throughout the steam bathing experience. Designed with a built in essential oil reservoir, you may create your own Aromatic steam experience. High-grade steam heads remain “cool-to-the-touch” throughout the steam bathing experience. Available in Square or Round form, to match your selected iTempo controller. Polished Chrome as standard with designer finishes available.